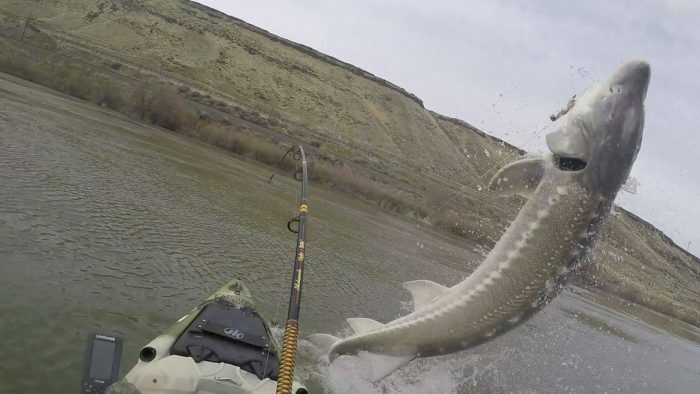 An Idaho angler landed the sturgeon of a lifetime on the Snake River but the story gets wilder. He was also fishing from a kayak and captured the experience on video. According to an article in the Spokesman Review, it took and hour for Bryce Thompson to reel in the 8 foot long female sturgeon. The feat is even more impressive considering it was Thompson’s first time fishing from a kayak and only his second time in a kayak. The Spokesman Review reported the fish weighed more than 300 pounds and measured about 42 inches around at its widest. That’s a monster fish. After an epic battle Thompson released the huge sturgeon to fight another day.